Case IH application technology, engineering and expertise helps you maximize your yield potential with and keep your fields clean and plants healthy, so you do your job quickly and efficiently every time. With technology like AccuBoom automatic section control, you can automatically turn off appropriate boom sections when the sprayer enters an area where product has already been applied, and automatically turn them back on when leaving a pre-applied area. Efficiently manage time and resources. AFS section and rate control allows you to put seed and fertilizer precisely where you want them. Reduce overlaps and manage input costs with automatic shutoff and turn-on for individual rows or sections. Automatically shut-off sections when you enter previously treated/seeded areas, during headland turns and around irregular boundaries. Make fewer trips across the field with variable-rate application of up to three different products in the same pass. 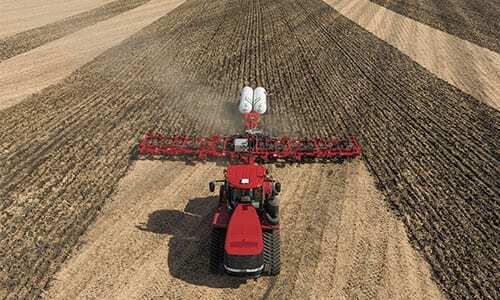 Case IH AFS certified dealers have a trained AFS sales specialist on staff to help you advance your farm. Find a dealer near you.